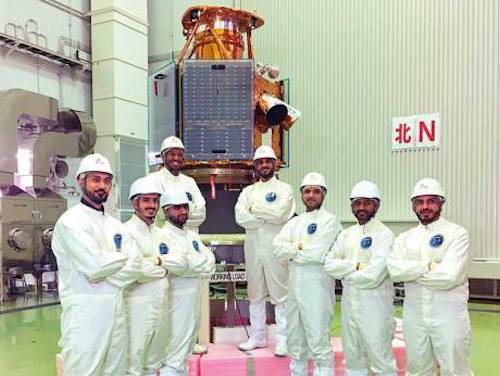 Dubai: A team from Mohammad Bin Rashid Space Centre (MBRSC) has conducted the final technical tests on KhalifaSat, which arrived at Tanegashima Space Centre in Japan. KhalifaSat was prepared for mating with the launch vehicle (Rocket H-IIA) and has been successfully installed into it and is awaiting launch on October 29. The satellite is stored within a specially designed area called the Vehicle Assembly Building (VAB) until the launch date. KhalifaSat must be present in this area for five to 40 days before the launch date. Technical tests were conducted on KhalifaSat to determine its safety on the rocket H-IIA. These tests include a functional verification test to confirm that all the sub-systems are working well, battery safety testing and other related tests. Mitsubishi Heavy Industries provided the team with all the necessary facilities to carry out these tests. Engineer Amer Al Sayegh, KhalifaSat Project Manager at MBRSC, highlighted that “conducting the technical tests on KhalifaSat at Tanegashima Space Centre on schedule reflects the success of MBRSC’s plan to launch it on October 29. It also shows the high level of professionalism of the 70 male and female Emirati engineers working on this huge project”. MBRSC had previously announced that October 29, 2018 is the official date for the launch of KhalifaSat, into orbit aboard H-IIA rocket at the Tanegashima Space Centre in Japan for a planned mission life of five years. For this, MBRSC is partnering with Mitsubishi Heavy Industries (MHI) and the Japan Aerospace Exploration Agency (JAXA). Once deployed into a Low Earth Orbit (about 613km up), it will capture and deliver high-quality detailed images of Earth to the ground station at MBRSC, Dubai. This service will assist government organisations and private sector enterprises all over the world. KhalifaSat weighs in at just 330kg. It contains an advanced positioning system that allows a large number of 3D images to be captured at once, with excellent accuracy and speed. The images will be used to detect the effects of global warming, ensure responsible urban planning and management, and aid relief efforts for natural disasters. KhalifaSat has a planned mission life of five years.